John joined QuadReal as Executive Vice President, Portfolio Management in February 2017. He focuses on driving performance and growth of the Canadian property portfolio, including investment, development and portfolio management activities. 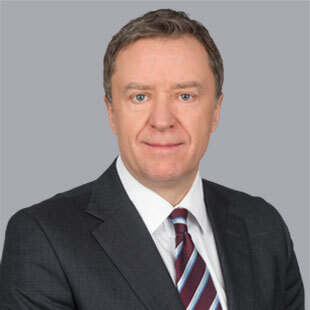 He was formerly Executive Vice President & Portfolio Manager of Bentall Kennedy, responsible for overall portfolio performance and asset management activities of the commercial and multi-residential properties managed by Bentall Kennedy on behalf of BCI. Previously, he was a senior executive of a Canadian REIT focused on investment and management in the hotel sector. John started his career as a lawyer with Davies, Ward, Phillips & Vineberg in Toronto, where he participated in numerous leading real estate financing and restructuring transactions. John holds an MBA from the University of British Columbia, an LL.B from the University of Toronto, and B.A. Economics from the University of Saskatchewan. Daily, he is inspired by and feels privileged to be working with QuadReal’s talented team of dedicated professionals.